There is one significant positive hanging over the U.S. economy that could help un-stick the seemingly endless no-growth cycle that has gripped business: the housing market recovery. Unlike the overall U.S. market, the housing market in Pittsburgh does not have to bounce back from falling prices and is showing remarkable consistency across a number of metrics. For more than six months the prices of houses sold and the number of homes sold have remained solidly up more than 10% year-over-year. That’s an unusual level of consistent growth, especially since the sales took place in periods of both higher and lower seasonal activity. The third quarter also showed a consistent trend in the year-over-year growth in new construction. Through nine months there were a total of 2,396 new dwelling units started compared to 2,155 during the same period in 2011, an increase of 11.2%. The increased activity was constant whether the construction was traditional detached single-family homes and attached or multi-family units, with each cohort up between 10-12%. Permits were issued for 1,393 units of detached dwellings compared to 1,264 in 2011 and for 1,003 attached units this year compared to 891 last year. A breakout of the top areas for construction is below. While there is growing evidence that financing conditions are normalizing so that buyers can buy, the dwindling supply of lots will keep a broader housing recovery from spreading into 2013, although the construction of multi-family apartments will boom for at least the next 18 months. If the developers stick to their plans there will be another 1,000 units started in large multi-family projects before the year ends in Green Tree and Southpointe. 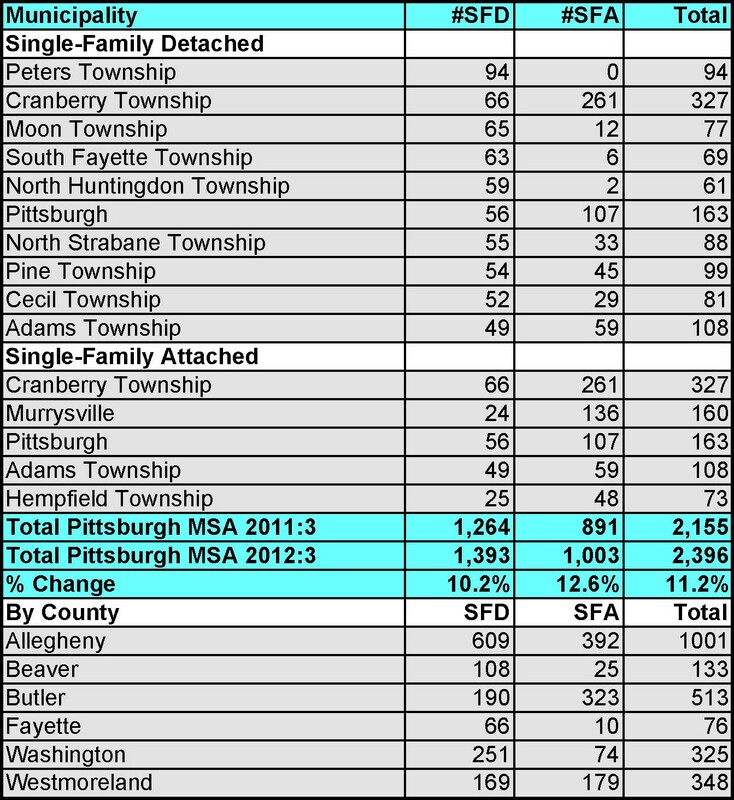 This is good news but the volume will skew the perception of the total market in Pittsburgh if that occurs. Should the activity unfold in that manner the total housing starts for 2012 will approach or exceed 4,000 units, a level not seen since 2006. On one hand the volume reflects the pent-up demand for housing in the region, but to more accurately judge that a true housing recovery is underway you should focus on the single-family detached market.